If you look at what “Hugo” won (5 awards) and what they lost (6 awards), I agree with all 11 choices. And yet, having just seen the film for the first time, I feel utterly unsatisfied and feel bait-and-switched by the trailers and what the film delivered. Who is this film for? The young? The families? The cineophiles? The Scorcese fans? All four categories will be let down in some small way. Nothing is horrible about this film. Everything is good or better, but nothing “dazzled”. It’s a 2 hr 5 min film that is more about George Melies, the french director/writer/actor/producer, than anybody else. Hugo, the boy, existing in the film is merely happenstance. Sure he found a family, but the story line with his father is incomplete. 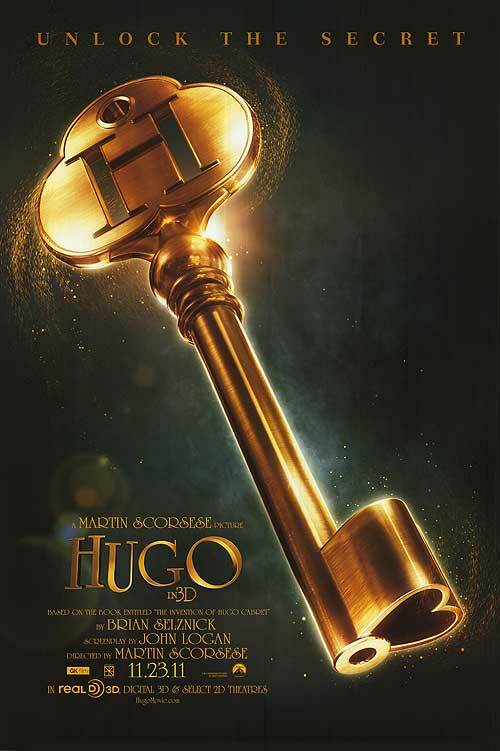 Giving the nominations “Hugo” recieved, I’m stunned with the film I just saw. If any one else directed this thing, or if it wasn’t about George Melies, “Hugo” would have been just another family film with little to no buzz — and while that sounds like a “dis”, it’s really not. It would have been an improvment since it would then not be trying to do so many things and would have recieved a more modest amount of awards, like two. Other films in Hugo’s categories at the 84th Academy Ceremony deserved it just as much if not more. Just for example, Cinematography could have easily gone to “Girl with the Dragon Tattoo” or “War Horse”, and Sound Editing really should have been a shoe-in for “Drive” or “Dragon Tattoo” again. This analysis and review was a major work I wrote in October of 2009 in a film History and appriciation class. I have just made some minor additions and corrections. Enjoy. There Will Be Blood is a film rich with substance for discussion; philosophically, thematically, and cinematically. The film is intense, unique, and stands out in contrast to the other releases in 2007, if not the decade. It has a timeless quality that makes it feel like it could have been made in any decade since 1930. The script is intelligent; the strong acting is brilliant and complex, and the cinematography from beginning to end is breathtaking. This is a film whose merit falls not in the special effects or action, but rather its strength as a story, its sound mixing, unique orchestration, seamless editing, and emotional content (arguably, more difficult and rewarding to capture on screen). The minimalistic approach makes the script and its ideals carry the narrative along. The opening shot is beautiful, just as every wide shot in this film is, but it also resembles a place without many people (if any people at all). This image is juxtaposed with the eerie clashing of string orchestration which continues to come and go for the duration of the film. The disharmonious musical score is effective in drawing an emotional response and putting the viewer in its environment; both geographically and psychologically. The dissonance is wonderful and not something often heard in American mainstream cinema post-2000. The film is almost a silent movie for the first fourteen minutes; besides the sound effects, there is no dialogue. It is 1898, and Daniel Plainview is in a mine, presumably looking for oil. The editing rhythm of the film here makes one feel the time it takes to be hacking away in a mine. It’s edited to be seven minutes long; we see him working and sweating. We feel the solitude and see the lack of light deep in the ground. The sound effects are realistic, well-mixed, and conservative. Now we can deconstruct the goals of this man, as early on as this one scene. Why is he alone? Mining is surely a project for more men than just he. He then injures himself after finding some promising looking rocks which could signify oil. With a broken leg, he crawls and slides his way into town through desolation, but not before putting some of the ore or shale into his pocket. Rather than going to the hospital first, he goes to the oil/real estate people first to claim rights to the property. He lies on the floor with his broken leg and then signs his name on a paper. Here we learn early on something of Daniel Plainview that is both a strength and weakness. He is very ambitious, forgoing medical attention for profit, and above all things will try to succeed by his self if necessary. Still in silence, we jump to 1902, where he now has a crew drawing oil from the ground. Still, no words are spoken. We observe the primal and dangerous nature of the early pioneers of industry. When a man dies down in the well from an accident, Daniel takes in the dead man’s baby and names him H.W. It seems to be compassion, but that first instinct would be wrong. He uses the boy throughout the entire movie to inspire sympathy and work the angle of being a “family man”, even going as far as telling people his wife died in childbirth. It is cold and calculated, but effective. The fact that there is no dialogue in the first fourteen minutes of the film only accentuates the minimalistic, dissonant musical score and the realistically placed sound effects. Without dialogue, something modern audiences are very accustomed to, the filmmakers have still given us so much information about the character, something only the film medium can do. Daniel is a man of — not few words — only necessary words. He can talk a lot, but often, not at all. Unless he’s trying to get something from someone, he sees no reason to talk. He feels that most people are terrible; that there’s nothing worth liking. Daniel will say anything, however immoral and manipulative, to get what he wants. He is direct, aggressive, sly and collected. His doppelganger and enemy in the film, Eli Sunday, is fascinating, and perhaps the most complex character in the film. When we first meet Eli, he introduced himself as Paul Sunday and tells Daniel there might be oil by the Sunday Ranch. Daniel goes to where they live where something bizarre occurs. “Paul” said that he had a brother, Eli. We quickly discover that the name he has given, Paul, is actually a fake name, and there is only Eli. But why Eli has said this is quite ambiguous, and as the film continues, Eli’s very sanity is put into question. He even goes as far as to re-introduce himself as Eli to Daniel Plainview as if he they had not met just days ago. He says things in a haunting fashion and his mannerisms are sometimes very strange. The scene where Eli is giving a sermon at his church is certainly unsettling and cult-like (also, an amazing, long take of character acting). At this point, one could say that either Eli is truly crazy in general, or that he really believes in his sermons and that he has been touched by God. Maybe even worse, he is a lying false prophet and is actually the same type of person as Daniel. But an important comparison must be drawn here: Daniel Plainview and Eli Sunday both use a form of pageantry and deliver grandiose speeches when in front of people to get what they want. Whether they believe in what they are saying is irrelevant – they have power; Eli with his church and followers, Daniel with his swindling of families as if there was something in common with their ways of life. Eli and Daniel both have enormous ambitions. From the time these two characters first clash until the end of the film, there is a great competition and slow building hatred between the two of them. The difference is that where Daniel wants to succeed for the sake of money, Eli perhaps wants to build community recognition for himself and be a figure of spiritual enlightenment. They want two very different kinds of power, as can be proven from the first time Eli is on the screen, saying “God Bless” to everyone. Daniel only cares and talks about oil, whereas Eli only cares and talks about his church and tries to get funds from Daniel. In different ways, they are both ambitiously using people and the debate between who is more righteous or whose ends justify the means can be debated indefinitely. On a larger scale, one could look at their battle of pride and stubbornness as a metaphor for the changing times in which There Will Be Blood is placed – the turn of the century. During this time, business and religion were clashing. The film could be making a statement about the massive ideological differences between capitalism and religion. The battle of the times is manifested in the characters Eli and Daniel. And in the end of the movie, when “capitalism” clubs “religion” in the back of the head and religion dies (symbolized in Eli’s death), the movie perhaps makes a statement about a new power and evolution of man which is beginning to leave religion behind. Capitalism roars on as religion stumbles during the changing times. Even today, science is doing similar things to debunk religion. By the end of the film, 1927, we have watched Daniel slip into madness and loneliness. He still hates that he had to bend to the will of Eli and be baptized at his church years ago in order to gain land for his pipeline. Though he knows he will do anything it takes to succeed, his damaged pride infuriates him, and he will not only beat Eli at his own game, but literally kill him. He wants “no one else to succeed,” as he states in the film. A sickly looking Daniel sits beside a dead and still bleeding Eli as he utters the final line of the film. “I’m finished,” Plainview says. Yes he is – in all the ways one could mean it. He has beaten Eli, beaten the false prophet, and he is perhaps “finished” in his career and his life if he is found guilty of murder. Has all of these years been worth it? And for what? Money? Pride? It is one of the most memorable film endings in recent history which surely has audiences conversing and thinking as soon as the credits roll, as all good films do. The film’s significance is only amplified considering all the events leading up to this scene. The whole is greater than the sum of its parts. Both actors (Daniel Day-Lewis and Paul Dano) really put on a show in the final scene; a phenomenal display of acting, which won Daniel Day-Lewis an Oscar for Best Actor in 2007. Every corner of this film was realistic and controlled, and yet elicits fears and reactions from the viewing audience. Parts are visceral, unsettling, and physically affecting, which is a great testament to the medium when superb art can make people really “feel” something. Great writing by the screenwriter and director Paul Thomas Anderson. Bravo. That is an achievement in filmmaking. The long takes, deep focuses, complex mise-en-scene, and slow zooms/camera dollies were not distracting and only added to the experience. Without unnecessary bells and whistles, this film keeps the drama and tension going. However, some may say that it is too simple or slow in some areas; its length, and general meter/tempo as a whole could be lost on some viewers and be seen as boorish where “nothing really happens.” But this response could be rebutted by pointing out all of the rich, cerebral themes from the film; there are conflicts and ideologies lush for discussion: Greed, Ambition, Deceit, Capitalism, and Religion – all centered on the turn of the twentieth century in the United States. Observing the effects of oil, money, and social power on different peoples within a community was a study all its own, and quite interesting. Though not a movie for everyone, if one is inclined to enjoy character studies or films which feel like novels, well, buckle in and get ready to work your brain. There is a lot going on in There Will Be Blood. I love a good story. I love a good movie. And more movies than you may think are based off of novels. See how uninspired Hollywood grabs the good through another medium? There are a few reasons for this: for one thing, the story is already written in a novel and usually is overflowing with content. With what is basically a huge “treatment,” a production company will then get a screenwriter (or team of them) to adapt the work for the screen. Characters can be lost, dialogue changed, and whole scenes deleted or added, but, one would hope, with such substantial source material a sweet screenplay would be written up with all the good stuff from the book, right? Not always. To prove my point, simply look at the Harry Potter Series, Jurassic Park, No Country For Old men, and Never Let Me Go. I use these examples because they are all different and aI have read these novels. Jurassic Park is way, way different. Whether these are good or bad adaptations will change depending on whose opinion you listen to. The point is that things change from the book, and that’s because it is in a different medium and a new way to tell the story is necessary while simultaneously making you feel what you felt while reading it. Not freakin’ easy. There is now sound to your story, a written score of music, cadence of lines delivered from actors, and cinematography which needs to convey an ambiance. This year for the 83rd Annual Academy Awards, set for Sunday, February 27th at (8pm East/5pm pacific), several movies (like every year) are adaptations. Most of the best films often are. 127 Hours, The Social Network, and True Grit are this years films which were written by others first then optioned for a film. As you may know, not only is True Grit an adaptation from a book, but it is also a remake from the 1969 version with John Wayne. The best part, for me anyway, is comparing the two mediums for myself: book vs. film. Everyone has different expectations, and what I think is a flop, you might think is a home-run. And that’s the best part for me–that conversation and comparison. It’s fun!